The ascension to the English throne of James VI, King of Scots in 1603 was a monumental event in the history of both Scotland and England. But as the King of Scots headed south, what effect would his absence have on Scotland? This article will look at those effects to show that Scotland was affected in matters relating to government, it’s economy, feelings of fear and inferiority towards England, and, crucially, matters relating to the Scottish kirk. The very nature of an absentee monarch in 17th century Scotland was a dramatic change in the mechanism of government. Before 1603, the elite and nobility of Scotland could reasonably expect personal access to the king, and James himself participated in almost every major arena of Scottish politics, both in parliament and in the estates. This personal access to the king departed when he rode south. Historians have argued the case that absentee monarchy was not the earth-shattering event that it is widely conceived to be, with Jenny Wormald additionally in her book Scotland: A History adding that King James set up an ‘improved postal service’. However, it cannot be denied that even the best postal service would not be able to address the imbalance of the loss of James in the flesh, especially in the aftermath of a very divided and factionalist Scotland in the 16th century. A personal letter from the Earl of Rothes to Sir Robert Kerr, also complains of the ‘restrictions placed on the normal processes for politicians to advise the king’, a clear reference to the change from personal governance to governance by the pen, even though James seemed not to notice the rising tension in Scotland due to his absence, boasting “Here I sit, and governe Scotland by the pen. I write and it is done, and by a clearke of the councell I governe Scotland now, which others could not doe by the sword”. This appears to show a lack of awareness of how the Scottish nobility felt, although this was offset by the reliable Earl of Dunbar. The Earl came to influence Scottish politics greatly in his role for the king until he died in 1611, after which the problems of absentee monarchy became more evident. Jenny Wormald also argues that James may have been ‘misled by his advisors’ in regards to matters of union and the Five Articles of Perth’, but if the monarch were not absent from his kingdom, he would not be so vulnerable to misleading counsel, as characterised by Julian Goodare in The Reign of King James VI, ‘Surrounded by yes-men, James was unaware of the trouble brewing, or unable to change course to meet it’. The quote from King James may also highlight the increasing dictatorial nature of James’ governance in Scotland, an approach that would continue under his son Charles and, ultimately, contribute to his eventual fate on the executioner’s block. Although James is said to have kept many Scots in employ in his bedchamber, it would appear evident that towards the end of his reign, he had lost touch with the reality in Scotland itself, and the seeds of discontent had been sown even before Charles ascended to the throne in 1625. This all created, amongst the Scottish nobility, a feeling of inferiority to England in the eyes of their now absent king. A record from the Convention of the Burghs in 1604 clearly shows these feelings of inferiority in one specific element of the document. This convention met largely to discuss the king’s new demands and desire for a complete union with England as James himself is described as desiring to see ‘…a complete union – one king, one law, one church’. This convention was their response and, indeed, their demands should a union with England materialise. In this document, the Scottish nobility demand that King James reside in Scotland for three months of the year. By only asking for a quarter of the year, they clearly demonstrate an acceptance or resignation to the fact that Scotland is now a nation of secondary importance to their monarch. 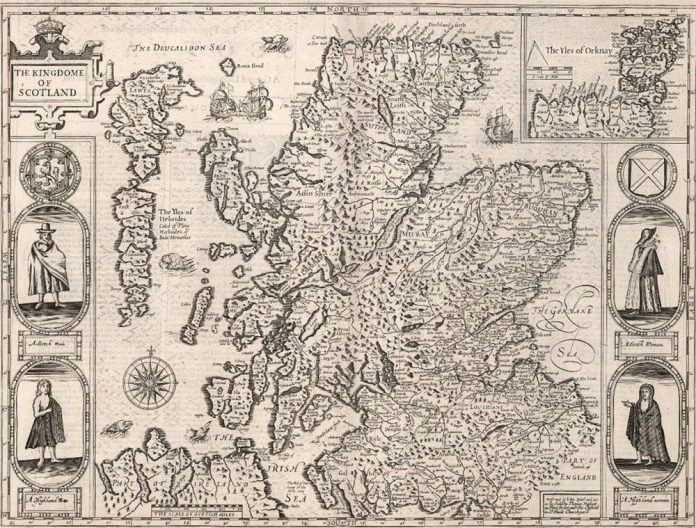 The reality that James only managed one visit to Scotland in twenty-two years up until his death in 1625 shows the validity of those concerns. Also to be found in this source are a series of requests made to preserve the institutions of Scotland in the event of union. This may show that there is a fear of being subsumed into a ‘Greater England’ and there may be evidence that their fears were well-founded as James planned that Scotland should “…with time, become but as Cumberland or Northumberland…” so, essentially, as a province within England. This place of secondary importance to King James is perhaps alluded to in the fact that John Leslie, Earl of Rothes and a prominent figure among the Scottish nobility, is forced to work through Sir Robert Kerr, a personal attendant of the future King Charles, as an intermediary, and does not himself possess a direct route to the king. In addition to this, as Rothes writes ‘I wrote to you about this before the death of James VI but you felt it would be wrong to mention them to Prince Charles’, it may be argued that Kerr did not feel any great desire to speak to Charles on Rothes’ behalf, for whatever purpose, personal or otherwise. St Giles’ Kirk in Edinburgh, common meeting place of the Scottish Parliament from 1563 to 1639. There is also, in the records of the Convention of the Burghs, demands for Scottish economic guarantees, firstly of a maintenance of their preferred merchant status in France, and a demand to be free from customs taxes when trading with England and Ireland These demands, combined with the seeming fact, if we look at the 1604 Instructions of the Conventions of the Burghs in its entirety, that also demands that James “…remember the lois sustenit be Scottismen in the King of Spain’s dominiouns and to treat reparatiouns thairoff”, seem to support the theory that Scots had begun to be dragged into English conflicts very early in the days of multiple monarchy, as the ‘undeclared’ Anglo-Spanish War (1585-1604) raged on. This would have a knock-on effect on Scottish trade, as would England’s frequent wars with France, and suggests that there was no coherent structure or neutrality in terms of economic mutual assistance. James had many issues to deal with as King of England, especially as England was a nation with two powerful adversaries in France and Spain. Scotland, it seemed, was to come second to its larger neighbour. 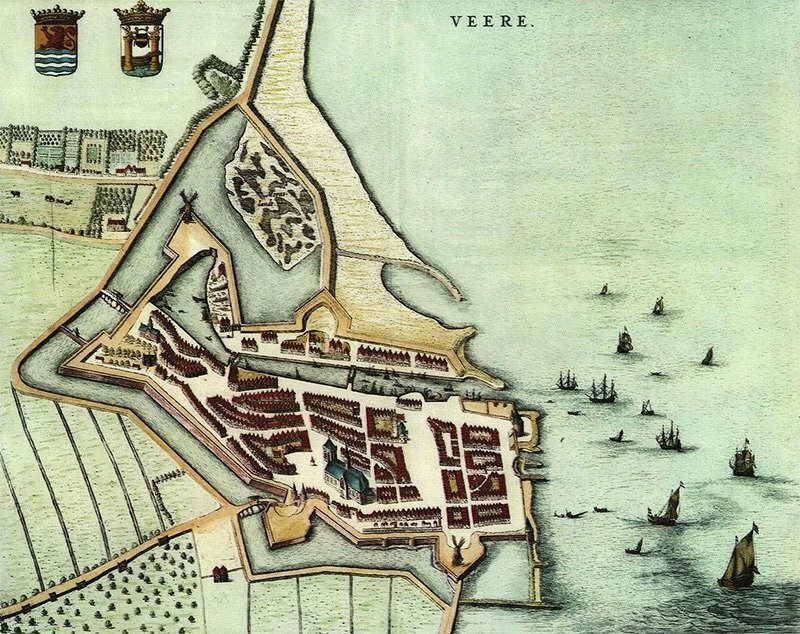 Willem Blaeu’s map of Veere, in the Netherlands. Veere functioned as the staple port for Scotland between 1541 and 1799. In Scotland it was known as Campvere. 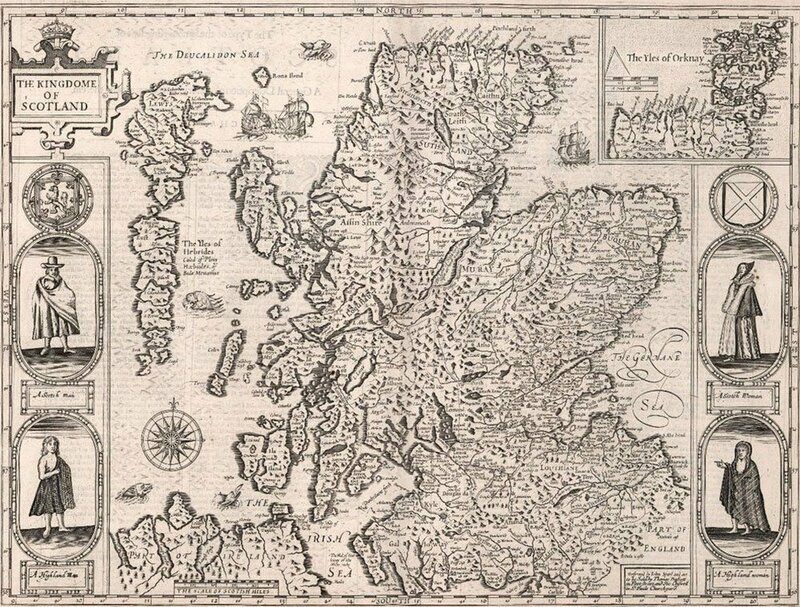 The economy and trade patterns of Scotland would be greatly and forever altered by the Regal Union of 1603. Scotland, by the time of James’ ascension to the English throne, had a solid traditional trading pattern, primarily with France, the nations of Central Europe, Scandinavia and the Baltic. This trading pattern was reinforced by the emigration of substantial numbers to these nations, especially to Poland, as will be discussed later. Yet, with the relative opening up of England to Scottish traders, the trend began to shift more towards markets closer to home. Furthermore, the Ulster plantation also aided this shift toward the west, as thousands of Scottish planters there now established firm trading links with the motherland. However, the new alignment with England was to have a negative effect on Scottish trade with Europe. Scotland had previously enjoyed special status in its trade with France, but with Scotland moving ever closer to England in economic as well as political and military matters, this began to change. Furthermore, Scottish merchant shipping became legitimate targets to the enemies of England during times of war, which were relatively frequent in the 17th century. Multiple monarchy also greatly influenced the direction of emigration from Scotland in the 17th century. Scotland had long been a nation of emigrants. 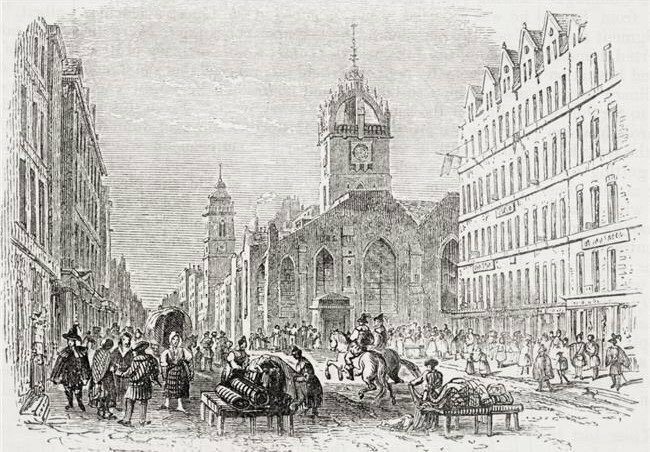 As previously mentioned, Scottish merchant communities had been established in Poland, among many other nations in Europe, along with the Dutch Republic and Sweden. 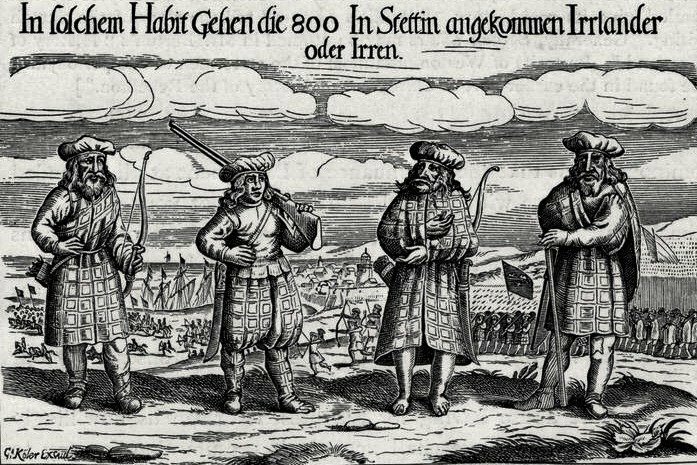 There were also substantial numbers of Scottish men enlisting to fight in European armies on the continent, especially during the Thirty Years War. But one of James’ first acts as a multiple monarch was to launch the Ulster plantations, which relied substantially on Scottish migrants to succeed. Thousands of Scots crossed the Irish Sea and would continue to do so in varying quantities for decades to come, especially during the devastating Scottish famines of the 1690s. In addition, many more Scots began to move south into England, especially into the areas around Newcastle and, most obviously, to London. Thus, Scotland’s tradition of emigration for varying factors was, by and large, unaffected. It was simply the destination which changed. The reason for this change was undoubtedly the Regal Union and multiple monarchy. Highland soldiers in Swedish service during the Thirty Years’ War (1618-1648). Arguably the biggest way that the absence of James affected Scotland was in the arena of religion. Since the Reformation in 1560, the kirk in Scotland had enjoyed considerable autonomy and influence in Scotland, and in the conflicts and civil wars that would grip Scotland, England and Ireland, from the rise of the Covenanters to the Restoration, religion would be a central factor. 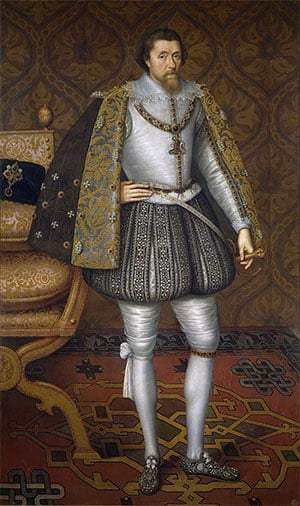 The fact that King James, upon ascending to the English throne in 1603, realised that he had much more power in the Anglican church as opposed to the Scottish kirk despite massive successes by James in bringing the kirk to heel in the years prior to 1603, set much of the subsequent events in motion, therefore there is a clear correlation between absentee monarchy and the eventual conflicts beginning in the late 1630’s. The influence of the Anglican church and James’ admiration of it had begun to grow in the first ten years of multiple monarchy, and as Pauline Croft argues in her article The Reign of King James VI and I: The Birth of Britain, by 1612 James was ‘intent on bringing the kirk nearer to the English model’, and, by extension, had become much less enamoured with the Scottish kirk. The biggest source of antagonism on the part of the kirk was, without question, the infamous Five Articles of Perth, which reintroduced things such as kneeling for communion and the celebration of Christmas and Easter. These issues were to provide the religious base of discontent and eventual resistance to the Stuart dynasty. Conrad Russell claims in his book The Fall of British Monarchies 1637-42 that James handled the religious issues well and moved both Scottish and English churches closer to each other little by little, and that it was more the incompetence of Charles that brought the multiple monarchy to ruin. However, the letter between Rothes and Kerr seems to argue against this viewpoint. In the letter, Rothes stresses how he wanted to pursue his complaints against the policies of James before the king had passed, clearly highlighting the fact that it was the policies of James that lay the foundations of the Covenanters Revolution, though the person of Charles undoubtedly greatly exacerbated the issue. It is of greater interest when considered that the author of the letter in question, the Earl of Rothes, himself went on to become one of the leaders of that revolution. This may support the theory that the letter of Rothes did not succeed in what the Earl had hoped, and his opposition to the monarchy only grew after its failure to alter royal policy, culminating in his important role in the Covenanters Revolution. The Regal Union of 1603 and the multiple monarchy that ensued had a tremendous effect on Scotland, and would continue to do so long after the reign of the first multiple monarch, King James VI and I. The different effects highlighted combine to give a broad insight into the depth of those changes in Scotland, and lead to a greater understanding to the conflict and strife that would emerge in Scotland and the rest of Britain in the 17th century.